1.To make the gulab jamun balls, mix chena, dhaap khoya, refined flour and green cardamom powder in a smooth dough. 2.Keep it aside. Next to prepare the syrup for the Gulab Jamun. 3.For the syrup, add sugar and water in pot and put it on slow fire till it turns in a semi thick sugar syrup. 4.For the main step, even sized balls of the khoya mixture needs to be made. 5.While doing so, add chopped pistachio in the khoya balls. 6.Deep fry them in hot refined oil on a slow fire till they are nice dark brown in colour. 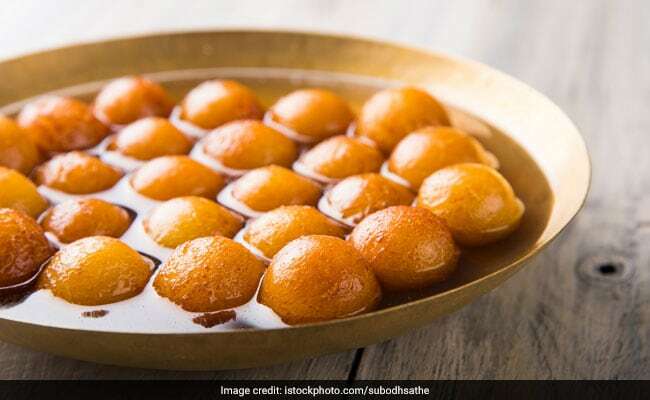 7.Immediately transfer the fried gulab jamuns into the hot sugar syrup. Keep them soaked in sugar syrup for at least 2 hours. 8.Serve hot garnished with sliced almonds.